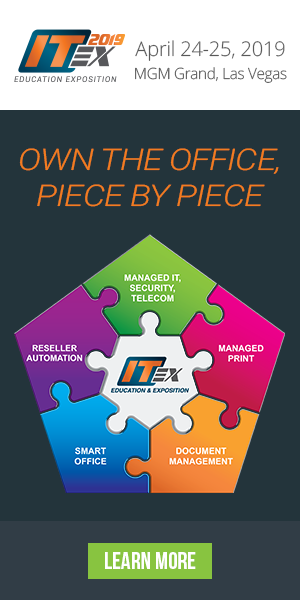 ITEX Imaging & Technology Education Exposition and ITEX 365 have been exploring the future of the workplace, also known as the “Smart Office”. The Smart Office encompasses similar technology implemented within the “Smart Home”, but rather, in the workplace. Large OEMs are forecasting how different trends and technologies can make the workplace safer, more efficient, and manageable remotely. While some areas of the Smart Office spotlight office technology devices, the Smart Office also covers reseller automation, digital workflow, meetings, and employee collaboration. Below is an interview summary with Sharp’s Vince Jannelli, Associate VP of Software and Product Management. Jannelli emphasizes meeting room technology, allowing Sharp customers to have easier collaboration and a smoother meeting room experience overall. The interview summary was written by Keypoint Intelligence’s Christine Dunne. Increasingly, the physical office is being used as a hub, says Sharp’s Vince Jannelli. Due to this emphasis on fluidity, Sharp is focusing the first of its “office of the future” initiatives on meeting room technology. This adds value around existing Sharp technology, for areas in which its channels already play. For instance, its new Alexa-like “assist bot” helps kick off meetings for individuals on Sharp AQUOS interactive displays. The overall goal is to help customers improve their meeting room experience. “Manhattan is a great place, so is Brooklyn,” he said. “Yet, if it weren’t for the bridges and tunnels, how would we enjoy it all?” Similarly, Sharp’s vision is to provide the connection—through its products and services—that makes the technology businesses use work better. Not only is this approach beneficial for the customer, it also helps Sharp’s channel partners stay more relevant with their customers by offering a broader set of goods and services. Through Sharp’s partnerships with Tech Data, dealers have access to a wide range of third-party solutions (e.g., mobility solutions, scanners, network routers, water systems) that can serve as new revenue streams as well as differentiators. “I think that a first-level benefit to channel partners is giving them ready access to the range of products their customers are buying,” Jannelli said. In addition to the Tech Data partnership, Sharp’s relatively new ownership by Foxconn is opening doors to Foxconn’s key technology contacts as well as potential partnerships. One example is the Skywell® atmospheric water generator that creates a new way to collect and dispense clean drinking water. It has taken the familiar office water cooler and introduced a revolutionary technology that creates clean water from the air we breathe, Jannelli said. The Skywell is a welcome connection to the smart office, where employees can opt-in to track personal water consumption via an application. More importantly, thanks to its integration with the Sharp’s Machine Intelligence Call Avoidance System (or MICAS IoT service), your dealer service teams can proactively ensure that each connected Skywell is producing water at optimum levels. Developed as an IoT platform, MICAS IoT works across Sharp’s B2B portfolio. It helps Sharp’s authorized service providers be more efficient by collecting service data and presenting service recommendations in a clear, easy to understand format. Simply put, it takes complex tables and computer talk, and converts it to usable, common language. Making information available in IoT communication is the secret sauce that turns mountains of data into usable information, he added. All of this can help Sharp leverage the newest technology (e.g., data collection, analytics, natural voice processing) to make office life smarter. Everything from turning data into usable information, to simplifying the meeting experience, to providing analytics on resource utilization, to helping employees optimize their water consumption is an example of a smart office. “By aggregating access and ultimately simplifying the use of these different services, provides something unique and differentiated in the marketplace that no one else can provide,” Jannelli said. In terms of marketing its office of the future solutions, Sharp will continue to strongly leverage digital marketing and search engine optimization for lead generation purposes. It will also continue to engage with online communities (like Spiceworks) to interact with business decision-makers, gain insight into their interests, and align services and messaging accordingly. Another key component for Sharp is marketing to its dealers. “The channel is our customer, as it is they that allow us to deliver value to the end customer,” Jannelli said. Christine Dunne is a Consultant for InfoTrends’ Office Technology and Services Group. Her responsibilities include responding to client inquiries, conducting market research and analysis, and providing coverage of industry events.